The festivities begin on Monday 4 March with the opening of the ‘Ain’t I A Woman!’ student jewellery exhibition and culminate on Thursday 28 March with a City Talk delivered by Helen Pankhurst, great-granddaughter of Emmeline Pankhurst who helped women win the right to vote. International Women’s Day is celebrated annually on 8 March. This year’s theme of #BalanceforBetter is a call-to-action for driving gender balance across the world. 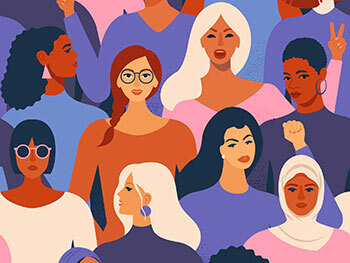 The month-long festival at Birmingham City University, dubbed ‘xCHANGE’, includes talks and activities that promote female activism and highlight gender inequalities in society, technology, media, health, politics and the cultural industries. Other festival highlights include the launch of ‘It’s Not About The Burqa’ (Picador) on Thursday 7 March, where writer Mariam Khan will discuss what it means to be a Muslim woman in the West today. Two weeks later, on Thursday 21 March, Birmingham City University’s School of Health Sciences host two sessions on raising awareness of female genital mutilation (FGM) with Birmingham midwife Alison Byrne. FGM, which refers to any procedure that intentionally alters female genital organs for non-medical reasons, has been illegal in the UK since 1985. As many as 100,000 women and girls in the UK are estimated to have undergone the illegal procedure. Festival Director and Senior Research Fellow at Birmingham City University, Dr Kate Carruthers Thomas, said: “This year we’re going all out with a jam-packed month of events for staff, students and members of the public. There’s an event for everyone and some really topical ones too which will no doubt encourage fascinating debates and discussion. For more information and to book tickets, visit @xCHANGE2019 on Twitter.